Cover Image - An image file that is specified as the Cover Image of the book. Cover Page - An XHTML content file that is displayed as part of the book content. 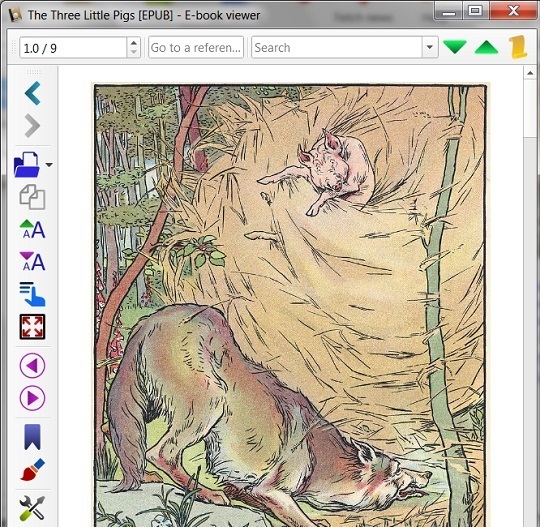 You can follow this tutorial to add a cover image and a cover page to your EPUB 3.1 book. 1. Get your cover image file ready with an aspect radio of 6"x9" (or 720x1080 pixel, assuming 120 DPI). The cover image can be stored in *.jpg format, for example: The-Wolf-Blows-Down-the-Straw-House.jpg. The image size should not be too big, better to be < 720x1080 pixels. Otherwise, EPUB readers may have issues displaying them. For example, you can download this EPUB book, 3Pigs4-3.1.epub, which contains a cover image and a cover page.